Because we picked this one as the final, we have it in a much higher resolution than the other options. If you like it, feel free to use it as a desktop image, or whatever! This might be a stupid question, but why is the bottom left corner of the image shaped like that? I assume it’s to match the circular starting points on the trace panels. The whole world is one large interactive screen. The starting point’s the sky. Is meant to be like a maze… Also, this is the best one of all the other concepts runner-ups! I wonder why the top down view tough? Because the game is not played like that. It’s a first person game, not a bird’s eye view game. 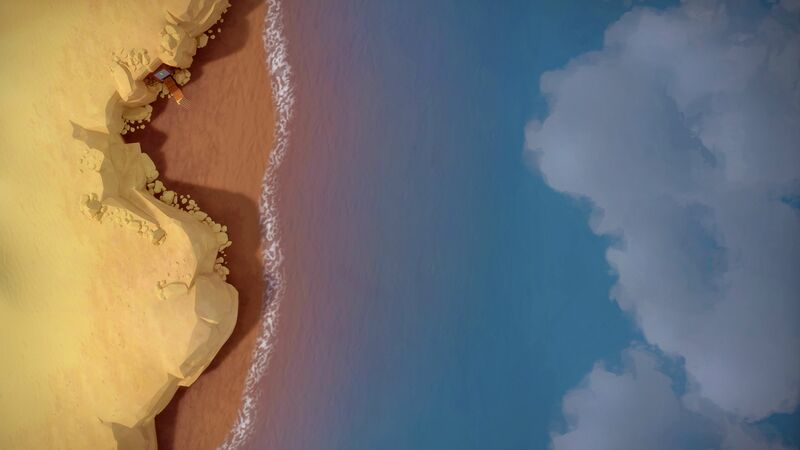 So is not gameplay, is not something you do and not even how you will really see the island. But hey, maybe you can fly in the game who knows! Ha ha good one. It’s just a poster and it doesn’t have to reflect gameplay, right? 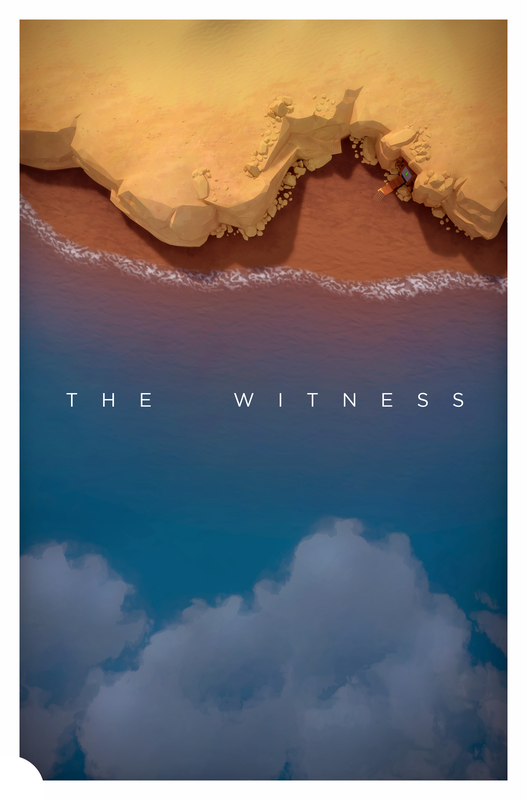 The game is definitely about witnessing different perspectives. Maybe we won’t see this one, but this angle well illustrates that idea. Why show a mathematical puzzle on a poster that may change your view of the world (which I doubt any single one could make the game seem intriguing as it’s totality is), when you can actually show a perspective that changes the way a person views the world? This leaves you with a vast feeling too rather than just a mathematical one. Obviously, I can’t claim to know precisely that’s what Jon is expressing with this, but I know what you mean man. Your logic makes total sense to me. I’m just throwing thoughts out there. The puzzles require you to visualize the game world from above. And there’s a hidden entity (God?) that follows you from up there. Do you plan to make it into prints? For now, new desktop background! How did you get this picture? Are you an insider? It’s just the poster in the blog post, but rotated to the left 90 degrees. No, you removed the text! Anyway, thanks! Really cool. Any possibility of a wallpaper version? I like how we see the reflections of the clouds in the sea, but no sky. It is a view from a plane going to The Island. Fabulous, absolutely love it. Like Max I’m wondering if there is a possibility of a wallpaper version, otherwise I may just use Nicolas’s image. I love the way the clouds mirror the land! Bravo! Oh man, I love this poster! Awesome job! Can’t wait to play this game! I like how the clouds are on the bottom and the land is on top. Not something you see that often. Then you’ve got the water in the middle which is typically a horizon view. Very obviously this game is all about witnessing different perspectives. Clever. I don’t know why we all put the fancy arteeest and graphic design expert treatment on your other runner up posters ha ha, even though they were really not that crucial to the game’s success, nor were you going to use them anyway. I guess we were just trying to be helpful. it’s inception *actually* making it onto iPad! “Faraway”, “Wolves of the Atlantic”, & “Oceanhorn”. for a state-of-the-art gaming console, I, unfortunately, just don’t see that happening …. Bravo! That is an absoulutely wonderful poster! It works on many resolution levels. First saw it in my RSS reader which was rather small. Still could read the text and see there’s a land mass, beach, water, and sky (which later realize a reflection). When looking at the larger resolution, there’s more to discover in the image. As to say, look closer to discover more. Wonderful work to whomever created the image! Great poster, makes me think of a Rothko painting. Jonathan, I’m searching for a new book to read right now : what is the last book that moved you? A Jonathan Blow book recommendation list would be awesome. As well as noticing what others have written, I’m guessing it’s not by chance that the clouds and land have an interlocking pattern – they could join to become one if pushed together. Looking at it I feel like everything is probably a metaphor – Jonathan can’t but help put a lot of thought, care and meaning into everything. What everyone else said: Clouds on the bottom. Land on the top. Genius. Is that the door in? Or is it the door out? I just pre-ordered my PS4 just to play this game! That’s even more beautiful than the concepts in my opinion. Nice one!